Teleflora's Mod About You in Surrey BC - La Belle Fleur Floral Boutique Ltd.
A mod bouquet of fresh lavender roses, blue iris and asters is the perfect way to express your enthusiasm. The cool tones and modern leaf-lined glass block vase make this floral arrangement an excellent gift for men, too! 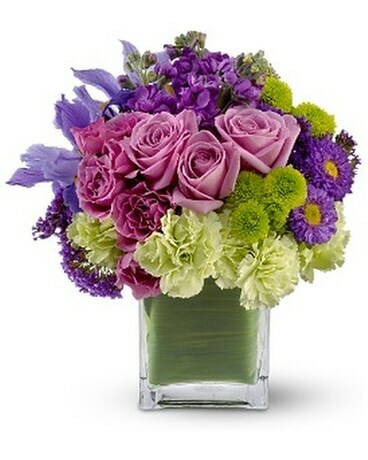 Lavender roses and spray roses, green carnations and button spray chrysanthemums and blue iris – plus purple Matsumoto asters, stock and Seafoam statice – are delivered in a clear glass Teleflora cube vase lined with Aspidistra leaves.